Amazon made sure to mention it had “listened to our critics ” when the company announced Tuesday it was raising the minimum wage for its workers to $US15 an hour. Indeed, Amazon’s pay practices have faced a lot of scrutiny – Sen. Bernie Sanders has been one of the most visible and ardent critics of Amazon. Most recently, the senator introduced a bill to Congress named after CEO Jeff Bezos, and has criticised the company for its practices in terms of employee pay, benefits and safety. But the flack Amazon has gotten hasn’t come from Sanders alone. As the largest online retailer in the United States, the company has been subject to scrutiny from politicians, activist groups, and small businesses as it continues to grow. 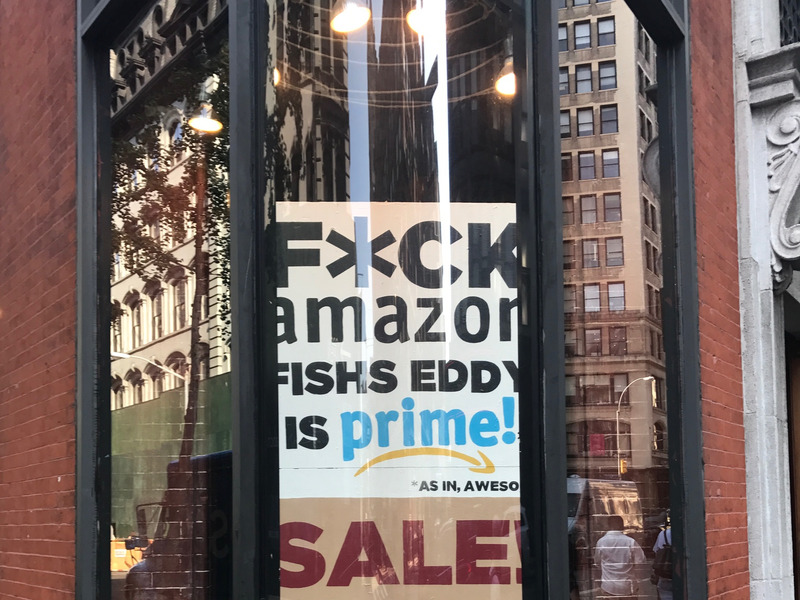 August 2017: Amazon’s acquisition of Whole Foods further established its position as a corporation on the rise, and a target for criticisms of destroying small business while subjecting employees to poor working conditions and minimum wage. While you may appreciate how easy it is to turn to Amazon as a one-stop retailer you don’t have to leave your couch to shop at, smaller businesses are struggling to keep up with the corporation. This situation was especially evident when Amazon acquired Whole Foods, sending other grocery chains scrambling to keep up. 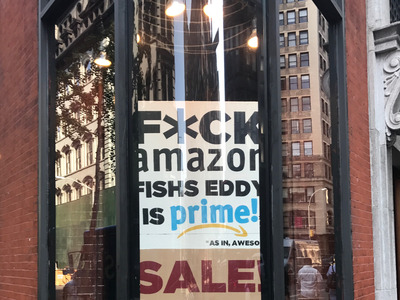 This retail takeover has contributed to the e-commerce giant’s growing reputation as “a symbol of everything wrong with big business.” Amazon’s place in the Reputation Institute’s ranking of popular companies has steadily fallen, and was pushed out of the top spot in the retail category by Barnes & Noble. Many of the concerns that have been raised over the steady rise of Amazon were once aimed at Walmart. These two mega-retailers share a history of worrisome claims over their respective working cultures. Employees of bother retailers have – for years – recounted tales of brutal working conditions, intimidating workplace regimes, and poor pay practices. March 2018: Sen. Bernie Sanders steps onto the scene of throwing jabs at Amazon and other corporations for their “extraordinary power.” But the senator wasn’t the first politician to lash out against big business — Donald Trump had already been name-dropping Amazon in several tweets for well over a year. Before Sanders zeroed in on the issue of Amazon’s worker pay, the corporation had been subject to criticism from highly visible politicians. 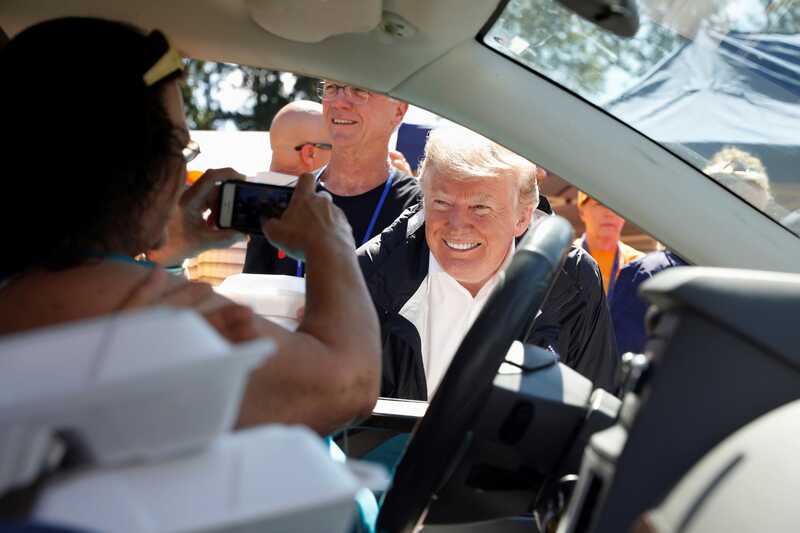 Amazon has been a frequent target for criticism from Trump’s personal Twitter account, but his attacks on the e-commerce giant are widespread: taking issue with its relationship with the U.S. Postal Service, accusing Bezos of using the Washington Post (which he owns)to lobby for Amazon, and blaming its tax practices for killing small businesses. April 2018: Several Amazon workers told Business Insider their “horror stories” of the working conditions inside the retailer’s warehouses. These accounts came soon after Bezos was named the richest man in the world. Soon after an undercover journalist revealed his experience working in Amazon’s warehouse (which he described as having the culture of a “prison”), multiple employees for the retailer shared their stories with Business Insider. In the wake of these stories, workers rights activists rebuked Amazon, and Bezos was greeted at an event in Berlin with protesters wanting to “make Amazon pay.” While the median annual compensation for Amazon employees was $US28,446 in April, Bezos’ compensation topped $US1.6 million. 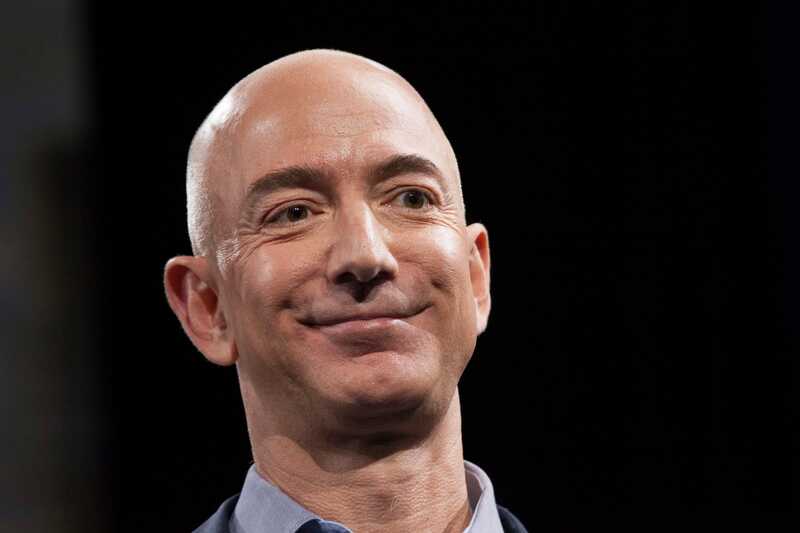 The following month, the Amazon founder and CEO officially became the richest man in recent history. 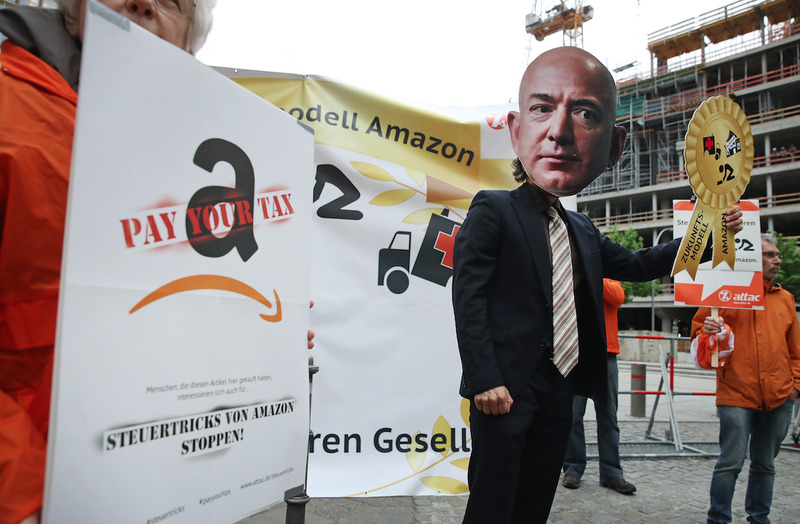 Sean Gallup/GettyA protester dressed as Amazon CEO Jeff Bezos at a demonstration in Berlin. Sanders also marked Prime Day by holding a town hall where employees of large corporations could talk about how they’re treated at work. Sanders’ comments on Prime Day marked a huge escalation in his vocal criticism of Amazon, and acted as a jumping off point for his remarks targeting the company in the months to follow. August 2018: Sanders steps up his attacks by highlighting the disparity between Bezos’ record-setting net worth of $US155 billion and the thousands of Amazon workers living on food stamps. Bernie Sanders started a petition in July to demand Bezos pay his employees a “living wage.” This marks Sanders changing his tactics in attacking Amazon, to focus on the specific issue of worker pay. August 2018: In a rare move, Amazon directly responded to Sanders. 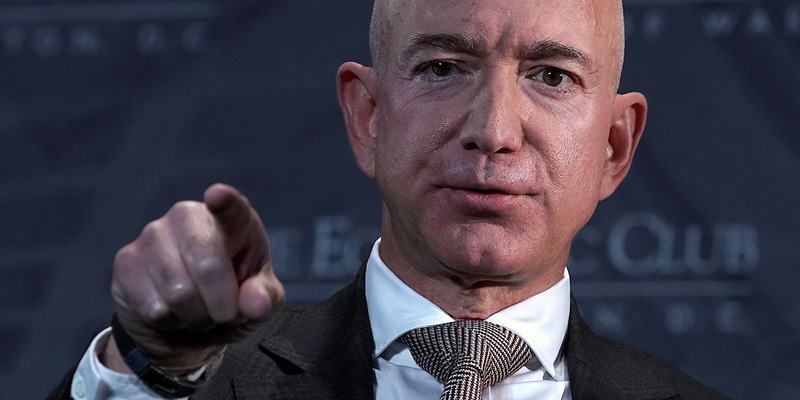 A “war of words” between Bezos and Sanders ensued over the state of Amazon’s worker conditions and pay. GettyAmazon CEO Jeff Bezos and Sen. Bernie Sanders. Amazon doesn’t often issue direct responses, but its statement in August called Sanders’ comments “misleading,” and argued its pay was generous and competitive in the industry. This very public back-and-forth between Sanders and Amazon was not the first time the two sides had interacted, however. Back in May, Amazon invited Sanders on Twitter to visit one of its fulfillment centres after another round of criticism from the senator. September 2018: Sanders proposed the “Stop BEZOS” bill, which would make huge companies like Amazon pay their employees better wages. The legislation (the “Stop Bad Employers by Zeroing Out Subsidies” bill) is literally named after Amazon’s CEO, although Sanders did emphasise that it wasn’t solely aimed at Bezos. 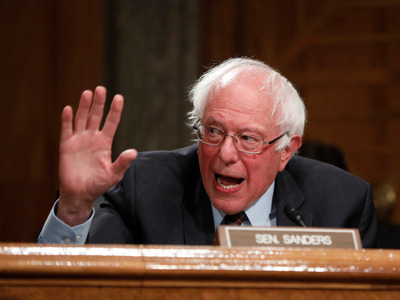 “I think it is fair to say that the American people are tired of having to subsidise the wealthiest people in this country who are paying wages that are just so low that people can’t get by,” Sanders said in a speech announcing the bill in early September. Sanders made known he planned to introduce the bill following his back-and-forth argument with Amazon. The bill would impose a 100 per cent tax on corporations that is equal to the amount of federal benefits their low-wage workers receive. October 2018: Amazon announced Tuesday it would be raising its minimum wage to $US15 an hour, which more than doubles where it was before. Sanders and Bezos publicly exchanged praise following the announcement, and the senator quickly shifted his focus toward worker pay at other companies. David Ryder/GettyAmazon CEO Jeff Bezos. Amazon’s minimum wage increase will take effect November 1st, affecting more than 250,000 employees. In its announcement Tuesday that it was raising pay to $US15 an hour, the corporation also expressed support for increasing the federal minimum wage from where it currently stands at $US7.25. 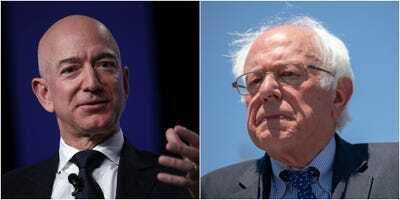 Following news of the pay raise, Sanders gave a short speech to “give credit where credit is due” and praise Bezos for “doing the right thing.” Bezos personally responded to the remarks and thanked the senator on Twitter. But Amazon’s acquiescence to Sanders’ pressure doesn’t mean the senator is done focusing on minimum wage. He encouraged other companies to follow Amazon’s lead and raise their pay as well.